BRISTOL - Some things are worth the wait. After waiting around all day Sunday and most of Monday to get its first chance in the Mid-Atlantic Regional, one inning was all it took for New Jersey to rediscover the form that got it to Bristol. Down 1-0 going into the bottom of the second, New Jersey put up four runs on the board off a pair of RBI from Joey Wall and RBI from each Dylan Briggs and Dylan Passo. 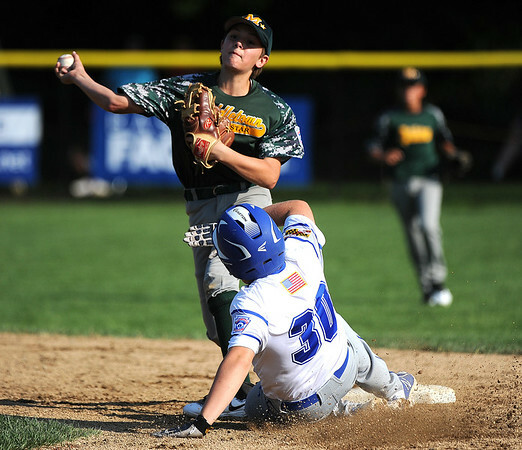 The four-run inning and a strong start on the mound from James Finer led New Jersey to a 6-2 victory over Maryland in the Little League Eastern Regional at Breen Field. Finer pitched five innings, allowing two earned runs and striking out six. Maryland, 1-0 coming in, had a chance for a comeback in the final inning with Finer pulled and Reid Tully on in relief. Case Tilghman opened the top of the sixth inning off with a single then with two outs, Waylon Hobgood was hit by a pitch and Gavin Solito walked to load the bases. Tully got himself in the jam and it was up to him to get out of it. He did just that, forcing Kannon Cropper to groundout for the third and final out. Tully was a change of pace from Finer on the mound, featuring a more finesse style of pitching and Maryland hitters were late catching up having just half an inning to do so. Leland Ossner (1-for-3), Timmy Naughton (2-for-3), Alfred Delia (2-for-2), Jason Quardt (1-for-1) and Wall (1-for-2) had the hits for New Jersey off Maryland starter Owen Knerr. Naughton also hit a double. Knerr helped himself on the mound with a home run in the top of the third inning but there wasn’t enough offense to top New Jersey. Stephen Wade (1-for-3), Knerr (1-for-2), Alex Navarro (2-for-3) and Tilghman (1-for-1) had the hits for Maryland. With the win, New Jersey will face New York Wednesday at 1 p.m. Maryland will take on Washington D.C. today at 10 a.m. While Washington D.C. teams are a combined 4-23 since 2010 in the tournament, Maryland manager Cameron McDonough coached the Maryland team in 2013 that lost to Washington D.C. after beating Delaware, the team that went on to the Little League World Series that year. Posted in The Bristol Press, General Sports on Monday, 6 August 2018 21:02. Updated: Monday, 6 August 2018 21:05.